WPX Hosting provides Domain Privacy with our supported domains. Purchasing a domain from us automatically grants you free WHOIS Privacy for life but what exactly is WHOIS Privacy and is it really that important...? Anyone who owns a website, be they a business owner, organisation, government, or everyday citizen, must provide accurate identification and contact information when registering their domain. WHOIS is a query and response protocol that will provide information on domain names and IP address blocks from a database. It literally asks ‘Who Is’ responsible for this IP address or domain! The query may include information such as domain ownership, the date and time of registering, expiration dates, and the nameservers assigned to the domain. The WHOIS protocol stores and delivers database content in a human-readable format. The Internet Corporation for Assigned Names and Numbers (ICANN) currently requires the e-mail addresses, phone numbers, and even mailing addresses of all owners and administrators of domains to be publicly available. If you own a website, then that means your personal information is being demanded to be made public on WHOIS directories. Any of this personal information will be available to anyone who queries a WHOIS server; this policy grants access even to identity thieves, spammers, and any other attackers. Continuous debates around what kind of changes could be made to WHOIS (to provide more privacy) were slow due to lack of consensus, but the ICANN has now moved to re-invent and improve WHOIS. Some hosting providers, who obviously own a lot of customers’ personal information, require little persuasion to release this private information and can earn money from doing this. Most however, do treat privacy more seriously. There are domain privacy services available from domain name registrars and web hosting platforms. When a user buys a privacy service, their service provider replaces the customer’s personal information in the WHOIS server with info to a forwarding service. This essentially redirects queries for your personal info elsewhere. The downside for many customers is the additional cost. The price for Domain Privacy is not regulated by anyone, so hosting companies can charge anything from a small extra fee annually, or even monthly! For example, GoDaddy offers limited Domain Privacy for £3.99 per year and more extensive privacy at £10.99 per year, while HostGator provides annual protection for WordPress hosting at $39.99 at the least. Bluehost also offers Domain Privacy for one domain on their Prime ($16.99) and Pro ($25.99) packages. At WPX however, you may have noticed how we like to offer lots of bonus features to our clients and WHOIS Protection is one of them. Domain Privacy is free with WPX Hosting. Although it is not something we advertise very much, the growing concern around online privacy and the complaints against certain hosting companies who sell private information have prompted us to reassure any WPX Hosting customers (potential or existing) that their information is in safe hands. How do I set up WHOIS Protection? As a customer of WPX Hosting, WHOIS Protection will already be enabled! If you purchased your domain with us, then your Domain Privacy will be active already. 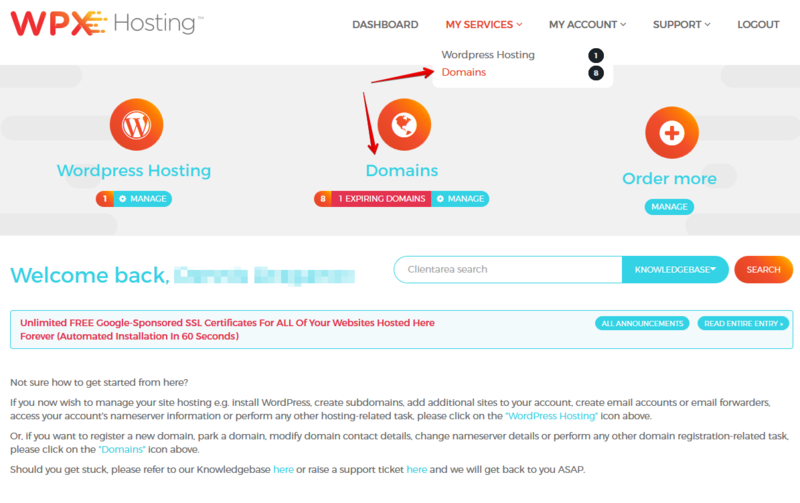 If you purchased your domain elsewhere, then Domain Privacy may or may not be enabled, depending on how your domain was set up before transferring it to WPX Hosting. It should be noted that some country-level domains in the European Union do not support WHOIS Protection (such as: .co.uk and .de, etc.). A full list of domains that do not support domain privacy can be found here. The Top Level Domains (TLDs) that do support WHOIS Privacy however, will allow you to enable it at any time from the client’s domain manager. This privacy service is completely free of charge while we are the domain registrar of the domain in question. 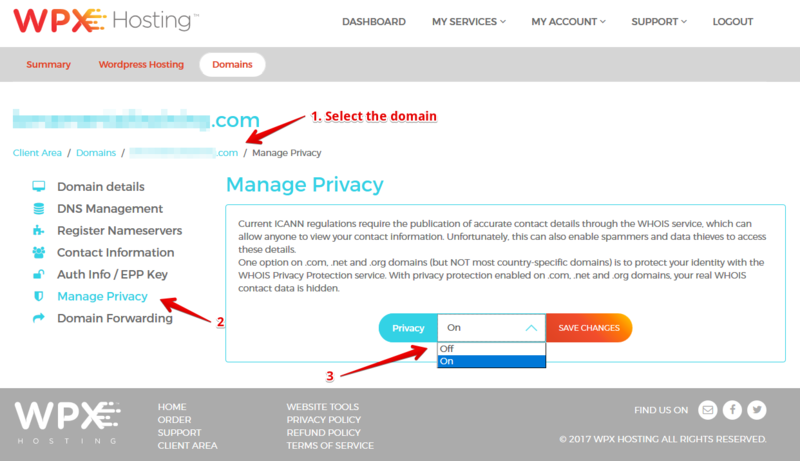 To enable WHOIS Protection (if it is not already), then go to wpxhosting.com and under the My Services tab, select Domains. From there, select the domain you wish to have WHOIS Protection enabled. Then, go to Manage Privacy and simply switch Domain Privacy ‘On’! WHOIS Protection should be enabled automatically as a WPX Hosting customer. Following these simple steps will allow you to enable it manually. Don’t forget that your migration will be free if you wish to move to our London servers (read more about our WordPress hosting in the UK here). For more information about our hosting service in New Zealand, click here. The benefits of WHOIS Privacy could be also reviewed on our Brazilian WordPress hosting (you can visit our website here). More about the WHOIS Protection could be read on our Australian website (we also have a CDN end point in Sydney too). To learn about Domain Privacy and WHOIS Protection (you can also visit our hosting in Germany here).